The First World War was, for Hannah Arendt, indescribable. Before and after the war are separated, she said “not like the end of an old and the beginning of a new period, but like the day before and the day after an explosion.”[i] The explosion produced an unstoppable chain reaction of hyperinflation, unemployment, hatred, civil war, and statelessness. Post-war avant-garde artists responded by trying to start anew, purifying art while breathing a putrid “atmosphere of disintegration”[ii]. “First Republic: 1918–1938”, at the Prague National Gallery’s Trade Fair Palace site, marks the centenary of the end of the war and Czechoslovakian statehood, introducing viewers to art of the nation’s interwar democracy. Czechoslovakian democracy lasted between independence from the Austro-Hungarian Empire (1918) and the Munich Agreement (1938). Though the dates are key to keeping the Czech national story intact, the art on display goes beyond them. The earliest work, placed in a reproduction of the Czech Room of Prague’s turn of the century Modern Gallery, is Impressionist Antonín Slaviček’s House in Kameničky (1904), a bright rendering of a cosy thatched cottage in an east Bohemian village, eighty miles from the capital. The latest is the disturbing Munich (1939) by Jan Zrzavý, who influenced Czech Surrealist groups of the period. In Munich, a mournful, ghost-like figure surrounded by cobweb spirals squeezes itself into a brick corner, recoiling from an oval burning into the night. Munich says nothing specific about the Munich Agreement, when British Prime Minister Neville Chamberlain and French Prime Minister Édouard Daladier tore up the Treaty of Versailles’ guarantees to Czechoslovakia. Does this unsettling figure represent the Czechoslovak people? Or the eerie, pale husk of democracy sacrificed for “peace in our time”? It is hard to say. We know now the worst was yet to come. Modern art seeks new foundations for society and life itself by liquidating all existing art categories, but political events are not the source of the novelty of avant-garde art. The relation between artistic and political revolution is more complex than that. Arendt distinguishes the “revolutionary spirit” of the American and French revolutions from “the modern yearning for novelty at any price”[v] typical of avant-garde art. Arendt’s distinctive understanding of the relation between art and politics does, however, clarify her comment about Czechoslovakian literature and sovereignty. For Arendt, art and politics are “interrelated and mutually dependent”[vi]. They coexist in a permanent state of irresolvable tension because politics needs art. Art and politics have a shared essence: appearance in a common world. Works of art and political actions must appear in public to be what they are. Great words and deeds can only have their enduring power if the world has been prepared to have a lasting meaning. Only artists can provide this, because they represent homo faber — the human ability to take charge of the external world by doing and making — in its highest capacity. Without artists, Arendt argues, political actions would not mean anything to subsequent generations: “In order to be what the world is always meant to be, a home for men during their life on earth, the human artifice must be a place fit for action and speech.”[vii] It is artists who record the deeds of men for posterity. Modern artists long for explosions but it would have been, as Czech critic Karel Teige put it, “dangerous luck for art to be responsible for historical events.”[viii] Though Czechoslovak art was not new in the same way as the Czechoslovak nation, “First Republic” shows how the artistic developments opened a space for debates about Czechoslovak historical consciousness. Landscape paintings reflect pre-independence debates about national tradition, spurred by Czechoslovakia’s founding president Tomàš Garrigue Masaryk. Wojtech Hynais’s portrait of Masaryk (1919) sees the benevolent father of the republic, his stiff collar freshly starched, lean slightly to the right, as if listening to a fellow citizen’s entreaty, ever ready with wise advice. An idealistic younger generation influenced by Cubism were, however, indifferent to public opinion; following them, the radical Devětsil group rejected western artistic modernism and liberal democracy for “proletarian” art. None of this happened in a contextual vacuum, though, as shown in the reproduction of historically significant exhibitions in “First Republic”. This includes not only Modern Gallery’s Czech Room, but its French and German rooms, showing the relationship between Czech artists and their contemporaries, and avant-garde exhibitions by groups like The Obstinates and Devětsil. Early quarrels over Czech art’s “Czechness” climax in Masaryk’s claim that Czech writers of the revival sought “a more concrete Czech human being”[ix] in a rural idyll. Such visions appear even after independence. Otakar Kubín’s Shepherd (1922) shows a shepherd gently playing a pipe to a herd of grazing sheep. Václav Rabas’s Krušovice Fields (1926) captures the verdant rolling hills of central Bohemia. Dainty villages, bubbling streams, and the undulating landscape of valleys, meadows, and winding roads, and the simple folk who live there, appear in a variety of styles, mostly by provincial artists suspicious of city life. National consciousness met avant-garde art in Czech Cubist architecture. In contrast to Vienna’s neo-classical grandeur, the hybrid forms of Czech Cubism, Cubo-Expressionism and Rondocubism, fused Cubism with Slavic elements, making a “national style” for regained Czechoslovakian statehood. Cubist architecture was, however, a short-lived trend, but there was a significant strain of Czech Cubist painting. Invented by Pablo Picasso and George Braque in the 1900s, Cubism tried to paint, in one view, how knowledge comprises all possible views of an object (top, sides, front, back) at different times (past, present, future). Poet Guillaume Apollinaire claimed Cubist paintings took place in a “fourth dimension’ representing ‘the immensity of space eternalised in all directions at a given moment.”[x] Czech artist Bohumil Kubišta, at the same time, said artists should “choose such formal elements that would best express new themes implicit in the gravitational or atheistic principle”[xi] of modernity. Art historians often dismiss “derivative” Czech Cubism. “First Republic,” and the writings of Czech artists and critics, suggest the opposite. Czech Cubism in fact developed from dialogue between Czech and Parisian contemporaries; many Czech Cubists paid lengthy visits to Paris, discussing Cubist principles as equals, not imitators. 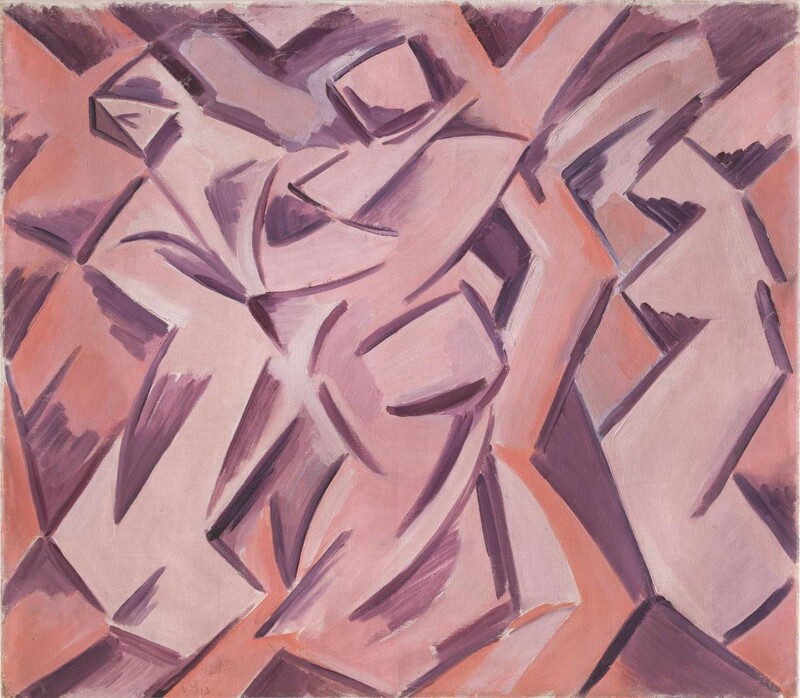 Václav Špála’s energetic Three Laundry Women (1913), for example, is like a brighter version of Picasso and Braque’s paintings of 1911, which almost abandoned the real world for total abstraction. Nothing is left of Masaryk’s “concrete human being” but the fitful, repetitive energy of scrubbing and folding clothes, the lingering dull stink of laundry fat. This kind of labor was, however, a point of principle for the Devětsil group. After Teige’s 1922 Paris trip, Devětsil aimed to synthesise the international avant-garde movements, motivated not by Masaryk’s new Czech human being, but human renewal. Charismatic, sexually liberated painter Toyen (Marie Čermínová) and her friend Jindřich Śtryský developed two types of Surrealism: “Poetism,” “an art of living and enjoying”[xii] and “Artficialism,” “the identification of painter and poet.”[xiii] This began in the mid-1920s with paintings of mostly recognisable subjects. Toyen’s Three Dancers (1925) shows three glamorous, disproportionately huge women on a wooden stage, their pubic hair showing beneath their long transparent skirts. Four suitors, bearing flowers, beg for their attention just below. Toyen captures the mysteries of sea life in Scuba Diver (1926) and Aquarium (1927); Śtryský’s Country Graveyard (1925) is surprisingly cheerful. From 1927–34, they move into imaginative abstraction. Only the titles of Toyen’s Autumn (Landscape) (1927), Shells and Fjords (both 1928) give the raw, congealed paint a clear reference. In Handshake (1934), three heaving fingers of paint stretch, dripping, across a scarred brown canvas. Voice in the Forest (1934) turns an echo in the dark into an explosion of loneliness. Two paintings by Śtryský, both entitled Roots (both 1934) show the long, slow process of organic life in Futurist-style fast-motion as a battered root endures the brutal storm of change. The First Czechoslovak Republic was born after an explosion but died in such a storm. The shards of the explosion spread differently at different times and scorched the earth in different ways. Independence nurtured new Czechoslovak art, but its new foundations were driven by the inner necessity of art-making itself, not politics. Karel Teige was right when he said artists are not responsible for political explosions. His belief that art had a political duty, however, separates the Czech avant-garde from us. [v] Hannah Arendt, On Revolution (1963), (New York: Penguin, 2006), p. 31. [vi] Hannah Arendt, ‘The Crisis in Culture: Its Social and its Political Significance’, in Between Past and Future: Eight Exercises in Political Thought (1961), (New York: Penguin, 2006), p. 215. [vii] Hannah Arendt, The Human Condition (1958), (Chicago: University of Chicago Press, 1998), pp. 173–4. [viii] Karel Teige, ‘Excerpts from Dada’ (1926), in Timothy O. Benson and Éva Forgacs, (ed. ), Between Worlds: A Sourcebook of Central European Avant-Gardes, 1910–1930, (Cambridge: MIT Press, 2002), (p. 380). [xi] Bohumil Kubišta, ‘The Intellectual Basis of Modern Time’ (1912–13), in Benson and Forgacs, Between Worlds, p. 102. [xii] Karel Teige, ‘Poetism’ (1924), in ibid. p. 579. [xiii] Jindřich Śtryský and Toyen, ‘Artificialism’ (1927–8), in ibid. p. 589.